The hit series is back, to inspire and charm another generation of baby-sitters! Stacey's so excited! 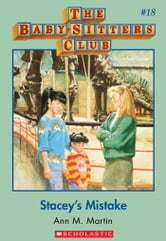 She's invited her friends in the Baby-sitters Club to New York City for a long weekend. It's going to be perfect--a party and a sleepover on Friday, a big baby-sitting job on Saturday, and lot of sightseeing on Sunday. But what a mistake! The BSC is way out of place in the big city. Mary Anne sounds like a walking guide book, Dawn is afraid of everything, Kristy can't keep her mouth shut, and Claudia is jealous of Stacey's friends. Can Stacey be in the BSC anymore? The best friends you'll ever have--with classic BSC covers and a letter from Ann M. Martin!